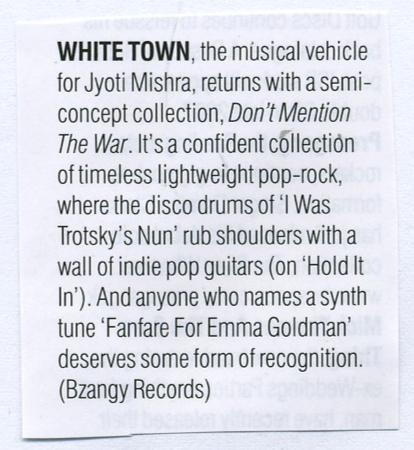 WHITE TOWN, the musical vehicle for Jyoti Mishra, returns with a semi-concept collection, Don’t Mention The War. It’s a confident collection of timeless lightweight pop-rock, where the disco drums of ‘I Was Trotsky’s Nun’ rub shoulders with a wall of indie pop guitars (on ‘Hold It In’). And anyone who names a synth tune ‘Fanfare For Emma Goldman’ deserves some form of recognition.